The Dead Zone is a horror/supernatural thriller novel by Stephen King published in 1979. It is his seventh novel and the fifth novel under his own name. It concerns Johnny Smith, who is injured in an accident and remains in a coma for nearly five years. Upon emergence, he exhibits clairvoyance and precognition with limitations, apparently because of a "dead zone," an area of his brain that suffered permanent damage as the result of his accident. The book was nominated for the Locus Award in 1980 and was dedicated to King's son Owen. The book spawned a 1983 film adaptation as well as a television series. The prologue introduces the two main characters. In 1953, a young boy named John Smith is knocked unconscious while ice-skating, When recovering, he mumbles a strange message ("Don't jump it no more") to an adult on the scene. The knot on Johnny's head fades after a few days, and he thinks no more of it. A few months later, the adult is seriously injured while he tries to jump start a car. Two years later, during an unconnected incident in Iowa, a young door to door Bible salesman, Greg Stillson, who suffers emotional issues and dreaming of greatness, vindictively kicks an aggressive dog to death. By 1970, Johnny is now a high school teacher in eastern Maine. After visiting a county fair with his girlfriend, Sarah, and eerily winning repeatedly at the wheel of fortune, Johnny is involved in a car accident on his way home which lands him in a coma for four and a half years. Upon waking, Johnny finds that he has suffered neural injury, but when he touches people and objects, he is able to tell them things that they did not know. For example, he knows that a nurse's son would have successful surgery; states that his doctor's mother, long believed dead, is living in Carmel, California; warns his physical therapist that her house is about to burn down; tells Sarah that her lost wedding ring is in her suitcase pocket; and later recounts the story behind a St. Christopher medallion that is owned by a skeptical reporter. Johnny shrugs off local media reports of his supposed psychic talents and accepts an offer to resume teaching, but he begins to suffer from severe headaches. Richard Dees, a reporter for the national tabloid Inside View, makes an unsolicited visit to Johnny's house to offer him a lucrative position: writing psychic predictions for the newspaper. When Dees explains that they would essentially be running only fake predictions under Johnny's name, Johnny violently ejects him from the property. In retaliation, Inside View maliciously prints a story denouncing his clairvoyance as phony, but that brings Johnny relief, he now hopes to resume a normal life. The hope is soon broken, however, when he is contacted by Sheriff George Bannerman who is desperate to solve a series of murders. Johnny is initially reluctant to publicize his abilities further but changes his mind after a nine-year-old becomes the killer's latest victim. Johnny's extra sense provides enough detail to identify the killer; Bannerman's deputy Frank Dodd, a sexual sadist who commits suicide and leaves a confession after seeing Johnny at the scene. The nationally reported incident reignites the public's interest in Johnny's clairvoyance. Stillson, now a successful businessman and elected mayor of Ridgeway, New Hampshire, still suffers from his emotional problems. Asked to "straighten out" a friend's teenaged nephew for wearing an obscene T-shirt, he sets the shirt on fire, terrorizes the youth with a broken bottle, and threatens to kill him if he tells anyone. In 1976, he decides to run an independent campaign for a seat in the House of Representatives and blackmails a local businessman into raising funds for him. Johnny's offer to return to his teaching job is rescinded as he is considered "too controversial to be effective as a teacher." He moves to New Hampshire and takes a job as a tutor for a wealthy young man, Chuck. He also takes up an interest in politics and becomes concerned when he watches a rally for Stillson. Johnny attends a rally for Stillson and, on touching his hand, has a horrific vision of an older Stillson who, as President, causes a massive, worldwide nuclear conflict. Johnny's health starts to worsen. He contemplates how he might prevent Stillson's presidency and compares the matter to the question of whether one could kill Hitler in 1932 if time travel were possible. Eventually, he concludes that the only certain way to avoid the terrible future he has seen is to assassinate Stillson ("You can't run for President if you're a corpse"), but he procrastinates. He rationalizes his inaction is because of doubt in the vision he has seen and his abhorrence of murder as well as his belief that there is no urgent need to act immediately. As Johnny continues to contemplate the matter, he has another vision and warns Chuck not to go to his high school graduation party because the facility will be struck by lightning and will burn down. Chuck's father agrees to host an alternative party for Chuck and other students, but their party at home is interrupted by news of a lightning strike and many deaths at the original venue. Johnny also learns that an FBI agent, who had been investigating Stillson, had been murdered with a car bomb. Johnny moves to Phoenix, where he takes a job as a road maintenance technician for the local Public Works Department. He learns that his headaches and blackouts are caused by a brain tumor and that without treatment, he has only a few months left to live (that is stated only in the epilogue). Johnny takes the fire at the party as a warning: he knew that the fire would happen but did not take that seriously enough and so people died. Realizing that he will not live much longer whatever he decides, Johnny refuses surgery and buys a rifle to shoot Stillson at the next rally. At the rally, Stillson begins his speech. Johnny attempts to shoot Stillson but misses and is wounded by Stillson's bodyguards. Before he can fire again, Stillson grabs a young child and holds him up as a human shield. Johnny pauses, unable to shoot, and is shot twice by the bodyguards. He falls off the balcony and fatally injures himself. A bystander photographs Stillson in the act of using the child as a shield, and when published, the picture destroys Stillson's political future. Dying, Johnny touches Stillson a final time but feels only dwindling impressions and knows that the terrible future has been prevented. An epilogue, "Notes from the Dead Zone", intersperses excerpts of letters from Johnny to his loved ones, a "Q & A" transcript of a purported Senate committee (chaired by real-life Maine Senator William Cohen) investigation of Johnny's attempt to assassinate Stillson, and a narrative of Sarah's visit to Johnny's grave. Sarah feels a brief moment of psychic contact with Johnny's spirit and, comforted, drives away. In 1983, the novel was adapted by screenwriter Jeffrey Boam into a film of the same name, starring Christopher Walken as Johnny and Martin Sheen as Greg Stillson. It was directed by David Cronenberg. 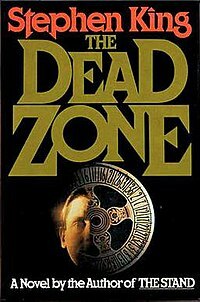 The television series The Dead Zone began broadcasting in late 2002. Starring Anthony Michael Hall as Johnny, Nicole de Boer as Sarah, and Sean Patrick Flanery as Greg Stillson. The series aired on the USA Network and gave Johnny and Sarah a son, born during Johnny's coma, but in the book, Johnny and Sarah had only kissed before his accident. ^ "1980 Award Winners & Nominees". Worlds Without End. Retrieved 2009-07-22.